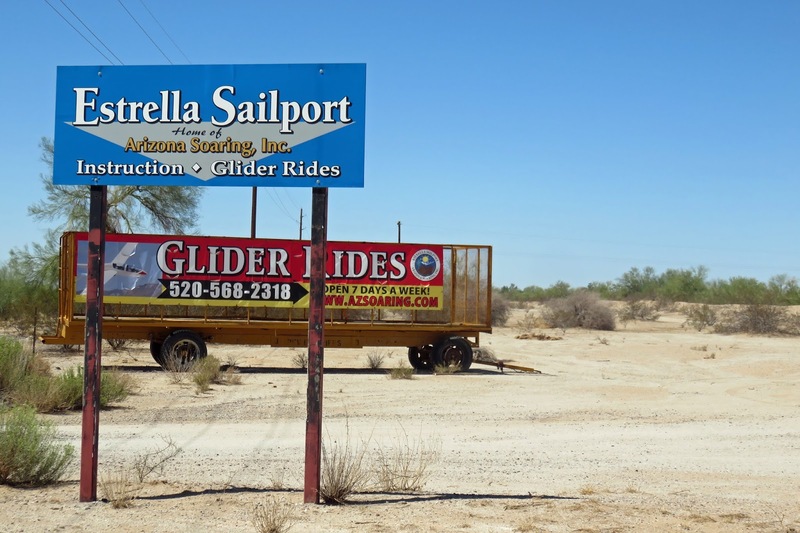 Over the weekend, we visited Arizona Soaring located at the Estrella Sailport in Maricopa, Arizona. 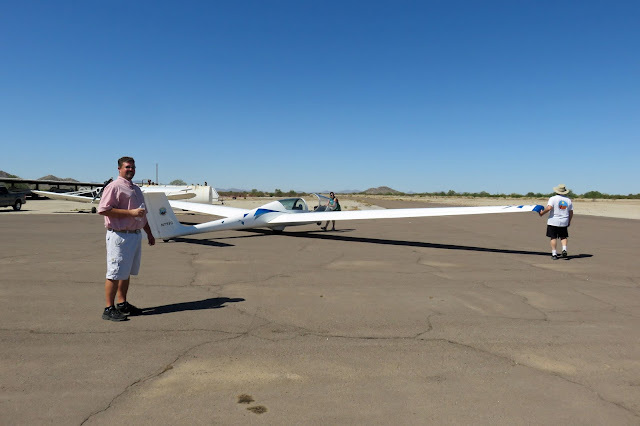 Ed is interested in learning how to fly gliders and wanted to talk to the instructors and see the facility in person. We met one of the instructors, Ron - who happened to be from Brooklyn and have ancestors from the same part of Italy my ancestors are from - who was happy to answer questions and show us around. I listened to the initial information but once he wanted to go tour the hangar, I decided to hang back with my friend Kim and wait for Ed to finish up. It was so hot at this point that Kim and I went to wait for Ed in the car. Until he called to tell me he was going up for a ride in one of the gliders! Here's Ed with the glider he's going to be riding in. They are pulling it onto the runway to position it for takeoff. The gliders don't have any power - no engines - they're propelled by the air flowing over the wings. And in order to get into the air that's going to flow over those wings, they have to be pulled into the sky by a tow plane. This is the tow plane. 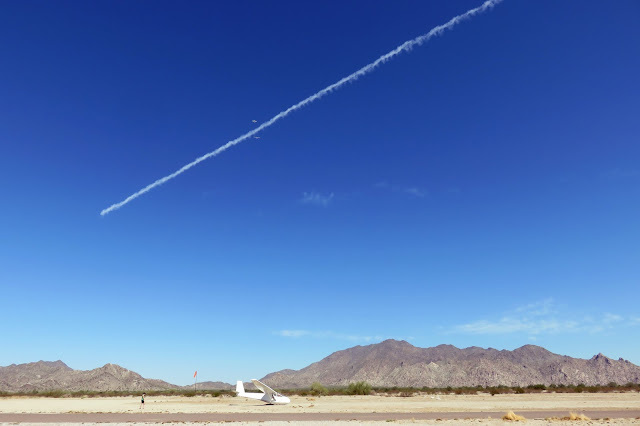 In this photo you can see two tiny specs on either side of that skinny cloud trail - it was the glider that went up before Ed. 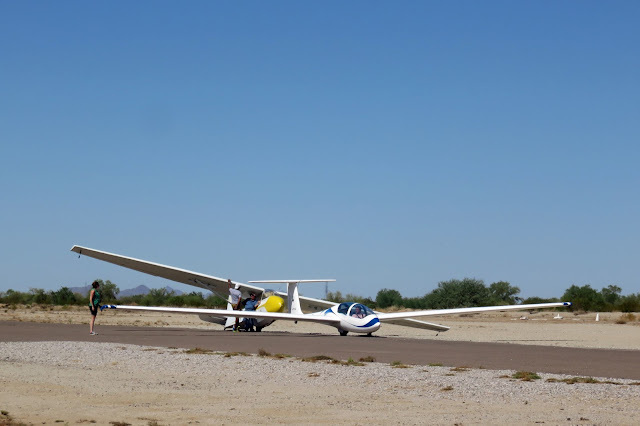 At takeoff, the glider is connected to the tow plane with a cable. 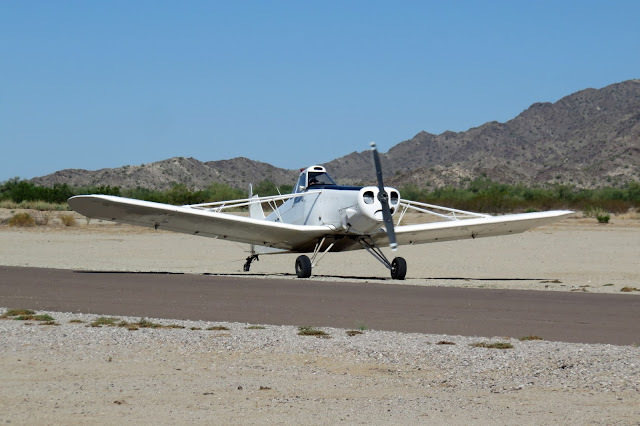 The tow plane starts down the runway, pulling the glider behind it, and takes off like you'd imagine any plane would. The glider is pulled by the cable into the air...up, up, up....until they're at about 3,000 feet. 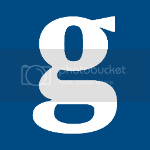 At that point, the glider pilot hits a lever that releases the cable. 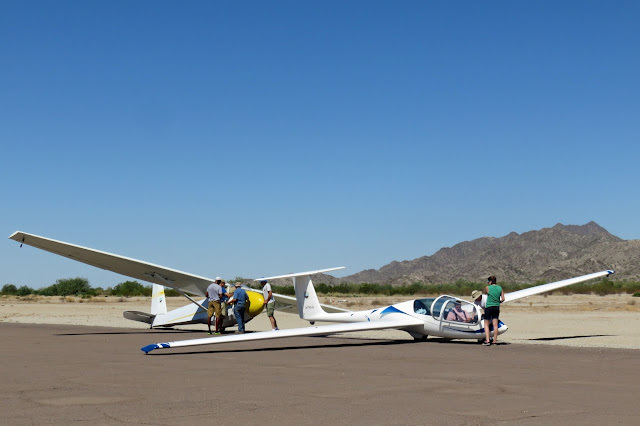 For safety, the tow plane swoops off to one side, the glider to the other. The glider is now on its own, at the mercy of the air flow. 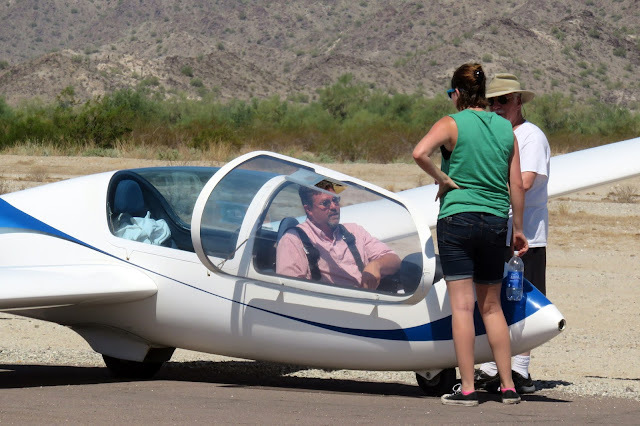 Here you'll see Ed watching Ron prepare the glider for his ride. He was doing a pre-flight inspection - checking the wings, controls, look for damage, etc. - pretty similar to what we do when completing a pre-trip inspection on the truck before our trips begin. The glider is very lightweight, it's made of fiberglass and weighs about 1,500 pounds. There's actually a weight limit for the front of the plane where the student sits. So if you're a fatty you can't even fly in this thing. Here's Ed after getting into the glider. He shimmied in, put the harness on, listened to Ron explain about the gauges, familiarize him with the flight stick, and more. The cockpit area looked a little tight, but not as tight a fit as James Cameron's ball was. Here they are, ready to take off. 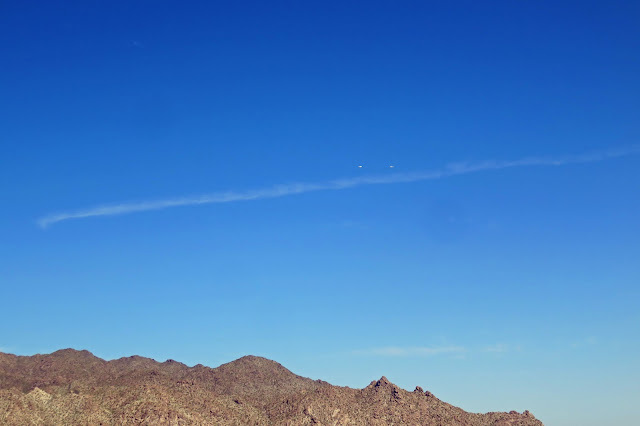 Those two tiny dots are the tow plane and Ed's glider behind it. They were up for about 30 minutes and the instructor even let Ed have a few minutes with the controls. Then he asked Ed if he liked roller coasters. Of course Ed said yes. 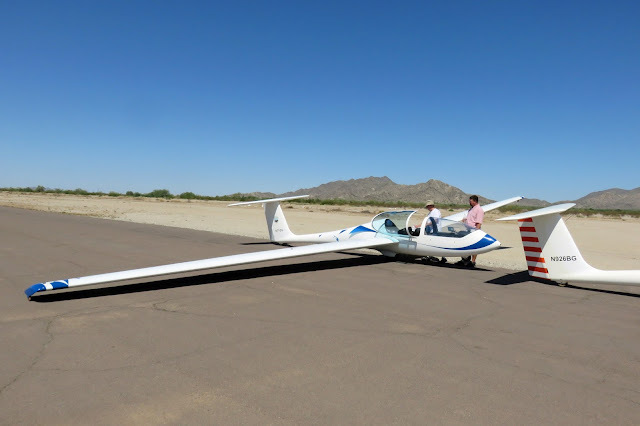 The instructor proceeded to do a few dips before taking the glider in for a landing. LIKE A KID IN A CANDY STORE!